Mishimoto aluminum competition lug nuts are an ideal upgrade for both performance and style. Mishimoto lug nuts are crafted from high-quality 7075 T6 aluminum, which offers the advantages of high strength and minimal weight. The open-end design allows for use on standard and extended studs, and the knurled ends allow for quick threading. The strong and durable threads allow for reliable and repeated installation. Each lug nut weighs just 0.8 ounces (23 grams) and is crafted from a CNC-machined extruded aluminum billet, which provides the highest possible precision and quality. 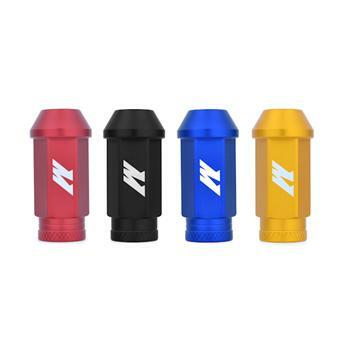 Mishimoto lug nuts are available in anodized black, blue, red, and gold and include a lifetime warranty on any manufacturer defects in the structural integrity of the product.